Medical Illustrator with the FSU College of Medicine Pursuing Illustration as a Career and Passion: Many young artists want to make a living from their work but aren’t sure how to begin. If you are an aspiring artist unfamiliar with illustration as a career choice, then come see Jodi Slade, FSU studio art alumna, Johns Hopkins grad, and current medical illustrator explore the many different avenues to begin, maintain, and advance a happy career as a professional person-who-draws-things. 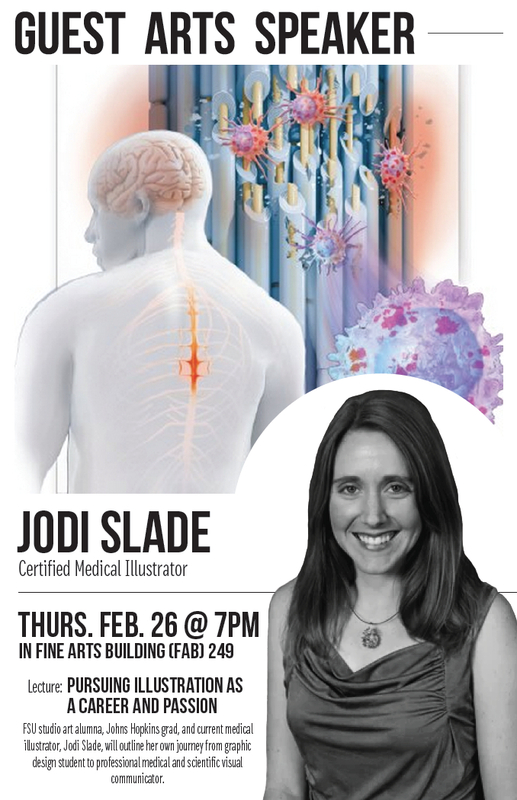 Jodi will outline her own journey from graphic design student to professional medical and scientific visual communicator, including some of the pitfalls and misconceptions along the way. She will also share some technical and professional tricks she’s learned over the past few years in the business to help get you started.Jodi graduated from FSU in 2008 with two degrees: one in studio art and another in Biology. She then attended the Johns Hopkins Medical School in Baltimore and completed her masters in Medical & Biological Illustration. After graduating in 2011, she came back to Florida State and became the medical illustrator and animator for the College of Medicine.